Entering the Cat Lounge is like entering and exiting a butterfly exhibit, there are double doors to make sure that you don't have any escapees before you enter the cafe area. Each cat wears a tag that lets you know the personality of each cat. Eat Purr Love is able to have fifteen cats in the Cat Lounge at a time, during our visit there were ten cats that we could visit with. Although a few of the cats were new all had a green or yellow collar when we visited. The best color of all was the blue tag, that meant that an adoption was pending. All cats at Eat Purr Love are available for adoption. Even if the cats are acclimating to their surroundings and are in the kitty condo (new resident housing) they are still available for adoption. All the resident cats appear in a photo collage. We got to meet everyone except Theodore -- he was in the human free zone. All of the cats have access to a human free zone where they can escape if they are feeling overwhelmed by all of the visitors. There are plenty of toys available and cat furniture all over the Cat Lounge. Constance was ready to play with Dave. Milo playing with some toys. We loved that they were able to pick-up toys to play with if they wanted to. Jasper spent the entire visit napping in the sunny window, whoever he is going home with is getting a really chill cat. In the other half of the Cat Lounge, Pep was hanging out in her favorite location on top of a cat tree. Pep is one of the oldest residents at Eat Purr Love. She's part of the "first generation" of kitties at the cafe. She was such a lovable cat. Near Pep's roost was the adoption wall, photos of all twenty-one cats that have been adopted are on the wall. We've been keeping track of all of the cats on Facebook, I fell in love with Waffles when the pictures of Eat Purr Love first opened, I'm so happy that he found a home. We found Johnny on top of a large shelving unit, I had trouble seeing him, but he opened his eyes and was enjoying a nice scratch under the collar provided by Dave. We found Molly at the bottom of Pep's cat tree, everywhere you looked there was another cat. Milo was our favorite (if it's okay to have favorites when all of the cats are so darn cute), neither of us has ever petted such a soft kitty. He was precious and oh so soft. All of the tables were topped with cat grass and cat coloring books, this would be the perfect place to have lunch during the work day. Think of the de-stressing possibilities -- coloring and cats! Cream hanging out near the windows. Pep was out and about at one point, she wanted to check out her surroundings before heading back to the cat tree. Dave and I have a cat named Cappuccino about the same age as Pep, our visit to the Cat Cafe reaffirmed our decision to adopt an older kitty. We loved Pep's laid back attitude. Spending some more time with Milo. During our visit someone was there looking at Constance and considering adopting her, hopefully playful Constance gets to go to her forever home soon! At the end of our hour we said good-bye to all of the cats. We told Pep that we hopes she finds her forever home soon. 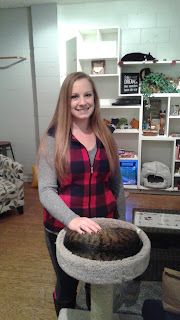 We had so much fun during our visit to Ear Purr Love, it was worth the two hour drive. I wish we had something similar to this in the Akron/Cleveland area, we would certainly consider something like this the next time we'd like to adopt a cat. Some of the newer cats weren't a fan of us, because they were still acclimating, but everyone loved to play. All of the cats with the green tags were great and if we had wanted to ask for assistance in picking them up, we would have been able to hold one of them. 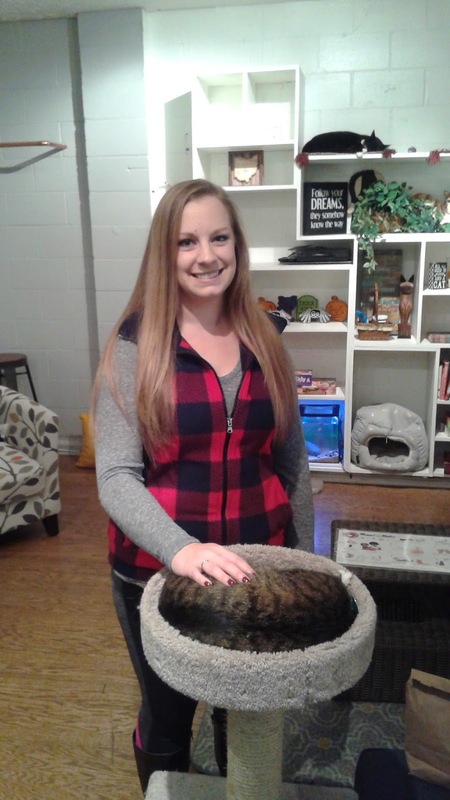 The staff was incredibly friendly and knowledgeable about the personality and quirks of each cat. The owner was on hand and assists with making sure each potential adopter leaves with the perfect match. At Eat Purr Love you'll only find adult cats, kittens have a much higher chance of adoption and the Humane Society has no issues placing them into loving homes. We're already planning on travelling back down to Columbus to visit Eat Purr Love in November with some friends. It was more than worth the trip.